Tree planting on agriculture land can produce nut crops, veneer logs, or saw timber. Our forester will write a tree-planting plan, arrange for tree seedling procurement, cold storage and conduct the tree planting. Weed control is an important part of plantation management. Heavy grass cover is the main reason most plantations fail. We offer herbicide application as a plantation management tool. There are several different herbicides that can be sprayed both before and after the trees are planted. We also offer mowing as a plantation management tool. Mowing between the rows can make your tree planting accessible to do other work such as corrective pruning and thinning. 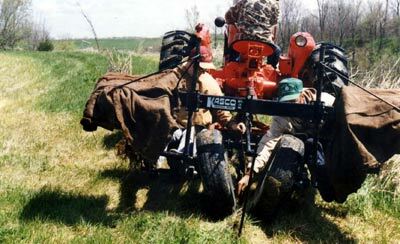 Mowing can also be done as a site preparation before the trees are planted.